Phoebe Philo’s Celine Spring Summer 2018 show took place at the Tennis Club de Paris, in a giant bubble tent by architect Smiljan Radie, with a collection where everything was a question of volume and style. 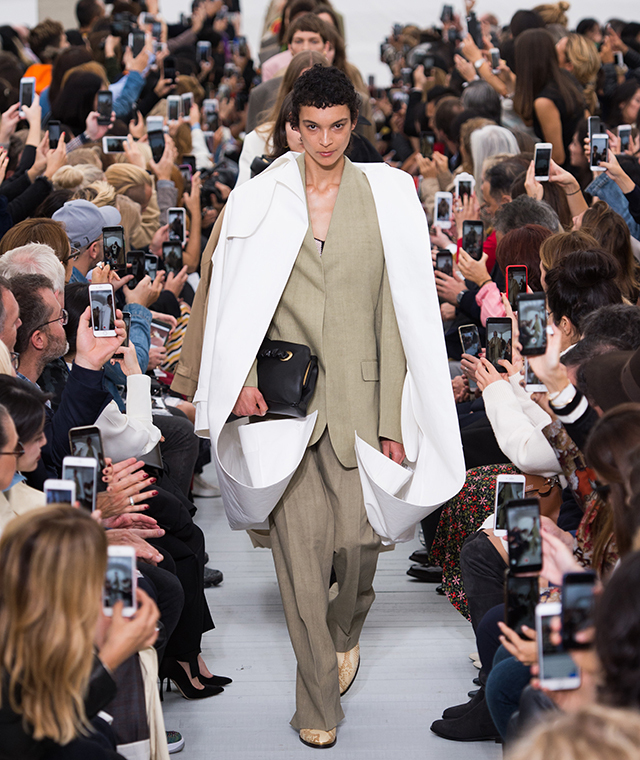 With the soundtrack by Mary J Blige’s “You’re All I Need” playing in the backdrop, the lineup started off with oversized suits worn with large trench coats in a neutral color palette. Followed by a button-less green suit hung loosely in a minimalist style. Overall the androgynous looks with deconstructed tailoring took the collection’s center stage. A pale pink suit tucked into the yellow asymmetrical hemmed skirt was one of the standout looks. Later on the collection has evolved from belted coats to a variety of feminine dresses with cheeky elements – dropped white fringe skirts, rippling stripes. For the accessories Phoebe offered huge oversized totes, softly padded clutches, from simple white mules to leather boots with voluminous bubble effect at the ankle and the Dad sneakers. This was a wearable collection set to actually fit to Celine women’s everyday lives.